The living area is open plan. In the lounge there are two double settees along with a matching armchair. Satellite TV is provided with UK channels including BBC, ITV and CH4. There is a dining area with table and chairs. The lounge has patio doors leading out to the sunny terrace and swimming pool. The master bedroom has a double bed, an ensuite bathroom and a window overlooking the private pool. The two twin bedrooms each have fitted wardrobes, a chest of drawers and a ceiling fan. Each of the 3 bedrooms have air conditioning! The fully fitted and equipped kitchen includes a fridge/freezer, dishwasher and washing machine. The villa also benefits from wi fi. Amarilla Golf is a resort all on its own. There are a few bars and restaurants, shops and a well stocked supermarket - all within a approximate 10 minute walk of the villa. The Premier Bar for instance is a favourite amongst regulars. 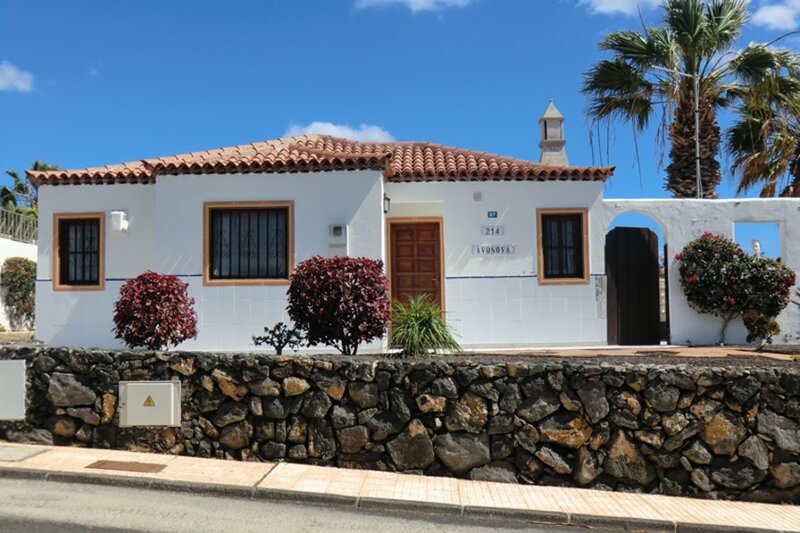 It offers a good mix of quality food, good prices and excellent entertainment.This detached private villa is set in a pretty and quiet area, absolutely ideal for a relaxing holiday, yet with excellent facilities within close walking distance. The villa benefits from a large private pool that can be heated if required (supplement - see pricing). There is a sheltered back terrace with a patio table and chairs. Plenty of sunbeds are provided by the pool along with a barbeque. A couple of minutes drive away or a 15 minute walk is the neighbouring resort of Golf del Sur resort. The marina separates the two resorts and here you will find some lovely sea front restaurants and bars. Some bars have nightly entertainment. The marina also has a small beach. Further into the resort of Golf Del Sur, the San Blas Commerical Centre offer 3 pretty squares lined with bars, restaurants, shops etc. Many of the restaurants have live acts. Golf Del Sur has an excellent medical centre / pharmacy. Los Cristianos is a mere 15 minute drive away and here you will find golden sandy beaches and plenty of shops, bars, restaurants and nightlife before you return back to the peacefulness of La Quinta.